After getting one of the last cards to get into this rare event, I was seated in a circle of chairs surrounding another circle of lovely ladies from the con. Fairies, pirates and super heroines abounded. The rules were simple: One minute per girl, one conversation at a time. While the organizers prepared for the event, I immediately sized up my competition. There were Stormtroopers, Time Lords, and participants that fell into many categories throughout the geek spectrum. I couldn’t help but push the rules a bit and began talking before the official start of the event … to three girls at the same time. I had to work quickly, as the ladies were already eyeing the circle for other potential matches. I felt the women were doing the same thing I was - they were looking for a possible match that spoke to their passions by what genre of fandom they were representing. I didn’t have a costume so I had to depend on my gift of gab as the event started. I opened with, “what sort of geek girl are you?” After all, if she was pirate and I was ninja, it would never work. I heard similar questions around me from the ladies to the men. Most common were “What are you into? Who’s your favorite hero?” along with excited confirmations of matching interests. Immediately I recognized something very interesting was occurring. Questions to potential matches from both sexes were not the typical questions you would expect to hear outside of geekdom. There were no blatant questions on politics or employment. It seemed more of an exchange to see how large your imagination was and if you could play well with others. Every minute, the organizers announced the men were to shift to their right and engage in conversation with the next woman seated in front of them. I found myself speaking with potential dates of various ages and interests. I wasn’t noticing their age based off physical looks, but more along what decade their favorite books or television show was from. I was more Dr.Who (Tom Baker) and Anne Rice vampires, so I found that was more telling of what I wanted in a match. The time flew by and before I knew it, I had talked to twenty-five women in twenty-five minutes that I probably would not have spoken to anywhere else. A break was announced for water and a chance to collect yourself for the next round of exchanges. Most people continued to speak with one another, not wanting to waste valuable time - a charged energy could be felt through the room. 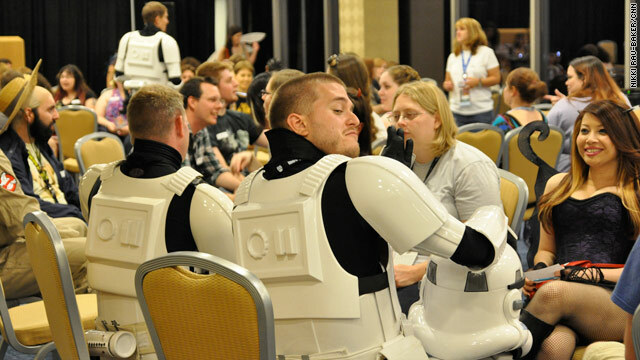 Earlier, a successful Lightspeed match couple from last year's Dragon*Con had been introduced to the room. The happy couple spoke of how Lightspeed Dating had given them the chance to find one another, giving hope to everyone looking for their own special geek in this very room. During the interlude, I observed a competitor taking a glass of water to a woman I was very interested in. I thought to myself “What a good move and WHY didn’t I think of that?” I had to be quick and returned with a secret weapon. From my pocket I removed a poker chip that had my name and phone number written on it. I told the woman in question I only had four and I was giving her my first one for a chance to gamble at love. Her face lit up and it seemed I had gained her attention once again. We spoke a bit more before the next round started. I could see she had written my information on her card and I let her see I had written her information on mine. Odds were, we would be speaking again soon. Throughout the event, one truth was becoming very evident to me: This room full of colorfully clad people wanted to make a connection with one another that transcended the everyday routine of life and extended into the realm of make believe and fantasy. Everyone here was looking for a friend, a partner, and a fellow traveler through the multi-verses of geekdom. I have my hopes I will find my Princess Leia to my Han Solo and perhaps The Force is with me on this one. Watch out guys! The Asian chick! IT'S A TRAP! Viewing the Headline Photo 25% of these people would fall under the Obama poor,but you can bet the gov't can find them just enough money to find these event's! The perfection comment is for "Joey", not all of us can be skinny and a..holes like you!! That Asian chick is apparently the only hot one there. Look in the background of that picture and see the overwhelming majority of uggos, just waiting to sink their teeth into the unsuspecting prey, like a Sarlaac Pit Monster. Apparently a lot of you are perfect, never heard so many perfect men in my life, ughhhs and fat. Would love to see a picture of you more than likely you are all ughhhhs also! I didn't think this sort of event wasn't possible. Isn't the guy to girl ratio something like 10:1? Anyway, that Asian girl will have no competition to deal with. She'll get her pick of a guy! Also, though there is some truth to stereotypes looks-wise, there are plenty of cute girls there, often dressed as anime characters or goth types. Hahahaha I like the pandering to the Star Wars fans he did throughout. The guy who wrote the article is a friend of mine and he's definitely more of a Star Trek fan than a Star Wars one. The man has several different models of phazers for God's sake lol. I'll take that Asian cutie on the far right. I'd dress up as a Rankor if she'd go out with me. I met my now fiancee at celabration 5 speed dating! May the force be with all you star crossed lovers! This totally worked for me! That was one of the worst experiences of my life. You got like 10 seconds to prepare, then 6 minutes to prove to the girl why she should pick you over the chump right behind you. Then a bell rings, and you get shoved off and forgotten while she starts warming up on the next guy. Ding – another guy. Ding – another guy. Ding – that's a lot of pressure to be under. It didn't help that it was my honeymoon, either. hes a cutie!! I hope he got her number too. If not, i have a cute 25 yr old niece he can go for! @Jimmy Jam- I hope that those sentiments you typed were true, because if they are, you are a very rare breed and should be commended. I had my husband of 10 years leave me after I got sick, gained weight from meds and couldn't be the bread-winner anymore. And this was *after* I nursed him through a potentially waist-down killing disease. I thought we were past the superficial, but I was very wrong. Great aitrlce but it didn't have everythingI didn't find the kitchen sink! It seems Asian women will do anything to get with a white man. You meant rich white men. Wow, they managed to find the one hot girl at the convention. Too bad they couldn't do a better job of hiding the other gargoyles. That's no way to talk about your Sister in public, Mike. You owe her an apology. Sigh. Lots of cuties at the con, dude. But I'd admit that the standard deviation of attractiveness is larger than in the general population (i.e., more than usual at both ends of the scale). Take a look at the women in the picture above – who would want to date them? Ugh... big, fat and not so good looking. Goooood Luck! Right. Because picking your mate based on looks alone is the foundation for a long-term, stable relationship. Spoken like a true 14 year old. You do realize that the woman you marry tomorrow will look vastly different in 20 years, right? Maybe she has a few kids and can't take off the baby weight. Maybe she develops diabetes or glandular issues as a result of her pregnancy and puts on a bit of weight, or has to have a limb amputated. Maybe she has a car accident that prevents her from working out, or scars her up a bit. What are you going to do, divorce her because she's not a hottie anymore? You must also realize that there are people out there who don't like the bone-thin look that's in right now. They like curves. Beauty, as they say, is in the eye of the beholder....and some of us fall in love with inner beauty as well as outer beauty. Now, back to Jersey Shore with you. Uh huh. And the first one your eye went to - the black-bustiered Asian, or the white-T-shirted blonde? I thought so. That's more the fault of the photographer. She is in focus for a reason. He chose her to be prominent and angled the shot. Apparently you are the epitomy of perfection....right huh? Soulgeek.com is a great site for nerds. It just needs more people over 40..... And in CA. She's nice. She's at the right place to find a few people who dress in costume for an event. If they like football they go to games with their chests painted and team hats and sweats on. Soulgeek.com might be what you're looking for. Check it out and find if there's something you're after on there. To this day I don't understand why there isn't some sort of dorkdater.com equivalent to Match.com and eharmony. Geeks want to meet other like-minded geeks looking for love. And lord knows some of those geeks can write computer software to match interests, who do you think those Match.com people contract the work out to? Geekharmony.com, dorkdater.com, or something like it should be out there. Dude, get on it and make some money! "And lord knows some of those geeks can write computer software to match interests, who do you think those Match.com people contract the work out to?" Its called world of warcraft!!
" I wasn’t noticing their age based off physical looks, but more along what decade their favorite books or television show was from." Same goes for computer games. Well, I'm still flattered when a girl looks me over and says, "Wow, nice Pong". The good news is that on your 15th anniversary, George Lucas comes over and re-films your honeymoon with all-new "special effects". This time the Ewoks look almost real. The bad news is that you have to tell your son Luke that his real dad is kind of a dirtbag. There is a dork/geek/nerd dating siting.